Photo caption, from left: Instructor Sharon Farrugia, RN, is teaching safety techniques to future personal care aides (PCA) Tyffany Mullen, Debra Corsette Magin, Tammy Johnson and Shaikuavia Byrd at newly renovated training space at HANCI’s headquarters in Niagara Falls. As a personal care aide with HANCI, you will be joining one of the five fastest growing jobs according to AARP. You can also earn a good living with benefits, work flexible hours that you choose, and you can change lives for the better as part of your job. Personal Care Aides (PCA’s) provide essential care to enable seniors and those with disabilities to reside safely in their homes and continue to participate in their communities. They also provide help and assistance to caregivers. Skills you will learn in HANCI’S free PCA classes include: personal care skills, safety and injury prevention, nutrition and meal preparation, working with people with disabilities, budgeting and working with children. 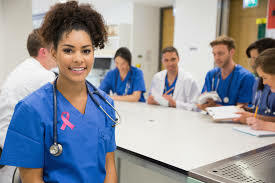 Once you have successfully completed the class and obtained your New York State Department of Health PCA certification – you will be eligible for immediate employment at HANCI. If you are interested in learning more about HANCI’s free PCA training classes, please call 716-285-8224. Ext. 239 to start the application process. Sign up for our free e-newsletter and stay up to date with the latest HANCI news and events. Your generosity can make a big difference in the lives of local seniors, children and families. Please consider making a donation today.